On Sunday, I talked briefly to a couple with these distinctive-looking dogs. 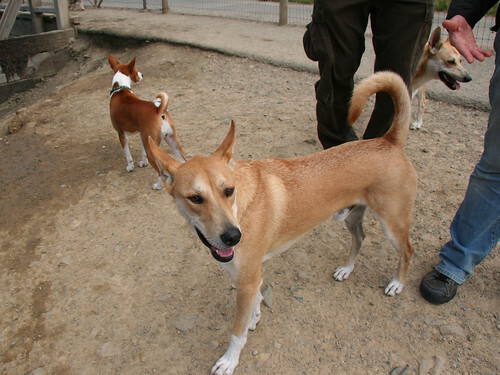 I was curious about them since they reminded me so much of some Shiba mix puppies I had seen in Taiwan, which I suspected of having been mixed with some indigenous tugou. Apparently, I wasn’t too far off in my guess about their “primitive” origins. 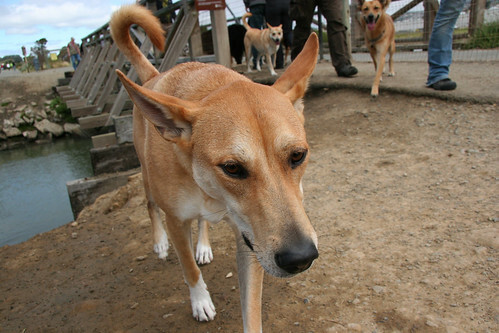 The couple told me that they were American Dingos. “American Jindos?” I asked skeptically, having heard incorrectly. “Nope, but they’re similar!” They’re also known as Carolina Dogs, according to the breed conservator that this couple got their dogs from. I don’t know much about these guys, but I suspect there’s an interesting history there. I have to admit that I’m so accustomed to the foreign provenance of pariah breeds, I seldom stop to think about those that may have originated right here in North America.